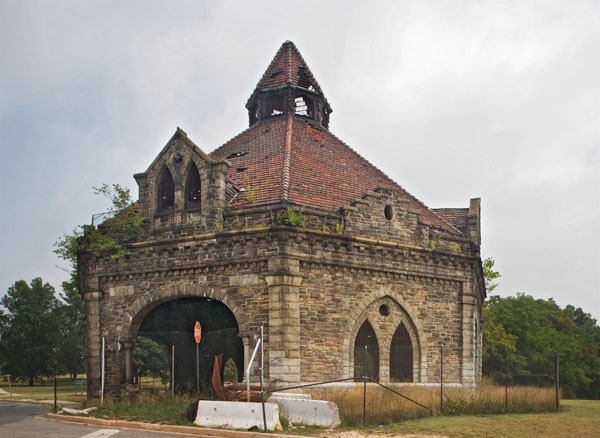 The Clifton Park Valve House has been threatened by neglect and disrepair since the early 1970s when Baltimore Heritage first recognized it as endangered. Baltimore City owns the building, and in 2003 a private developer began plans for the restoration and reuse of the building. This effort did not mature, and the City continues to own the building. The Clifton Park Valve House on St. Lo Drive in Clifton Park is a magnificent Gothic revival stone and tile-roofed structure built between 1887 and 1888. It was built to house the machinery used in the operation of Lake Clifton, which was once part of the city’s water supply and was connected to Lake Montebello to the north by a 108-inch underground pipe. Large wheels were set underneath the floor of the Valve House to regulate the flow of water from Lake Montebello. Lake Clifton began to be filled and developed with Lake Clifton High School in 1962. No longer needed, the Valve House was abandoned at that time. Designed in the style of a small medieval cathedral, it was listed on the National Register of Historic Places in 1971.